Students are graduating colleges of veterinary medicine without instruction in food animal care or animal welfare. MANHATTAN, Kan. (May 20, 2010) — “Animal welfare should be incorporated into every course at every level where there’s an opportunity to work with animals,” said Gatz Riddell at the International Symposium on Beef Cattle Welfare. 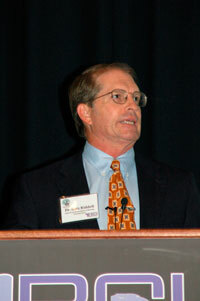 Riddell, professor emeritus at Auburn University and current executive vice president of the American Association of Bovine Practitioners (AABP), discussed the challenges faced by veterinary schools and colleges of animal science when trying to integrate animal welfare concepts and instruction into their respective courses. The economic realities of today dictate that funding for needed faculty and research opportunities will be limited, Riddell said. Particularly in the colleges of veterinary medicine, the diversity of students and the level of pre-veterinary experience makes curriculum development a challenge. Many schools are already tracking students through small animal, equine or food animal specialities instead of requiring exposure and experience in all areas, including research and animal welfare. Riddell said that while it can give graduates a higher level of expertise in their chosen speciality, it isolates more students from food animal practices and from an even basic understanding of what food animal veterinarians do. He cited negative comments from some small animal practitioners within the professional veterinary journals concerning food animal practices when their only knowledge of those practices came from movies and other public relations materials created by animal rights activists. In his experience as a professor, Riddell emphasized that the majority of veterinary students do not have an agricultural background. He said the best way he had found to handle student interactions, whether they had agriculture experience or not, was to answer questions honestly, to try to make the student’s experience in clinical applications as positive as possible, and to make sure he maintained contact with the students throughout the course. In closing, Riddell suggested that, in the interest of advancing animal welfare in the university curriculum, advocates should remember that economics and science cannot answer all the questions surrounding ethical and humane handling questions. He said there should be a singleness of purpose in the training and practice of veterinary medicine with an emphasis on One World-One Health concepts (see story about this concept in the May 2010 Angus Journal), and that the emphasis should be on one-on-one interactions.